Holly swam competitively for 13 years, as a member of the Kapuskasing swim team and as a Badger for the Brock University varsity team. She meddled at O.U.As and qualified for C.I.S three years in a row in her specialty, backstroke. After graduating from Sport Management, she has stayed in the Niagara region and works in Beamsville. 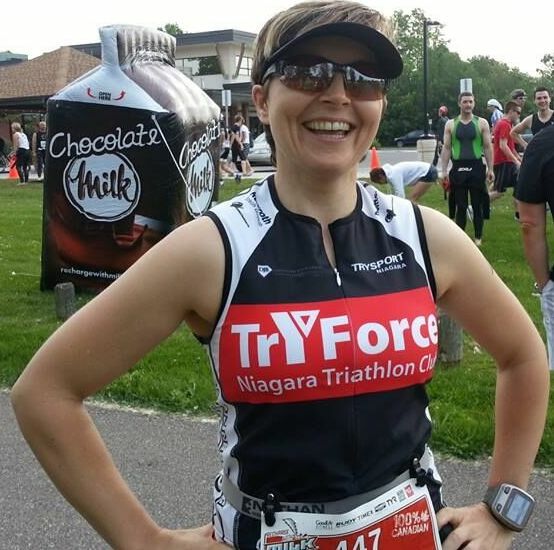 Holly joined the Tryforce team in early 2013 and completed the Niagara Try-A-Tri and Iron Girl Triathlons. Dan began multi-sport racing in 2006 and it has become his passion. He joined TrYForce in 2011 and recently completed his triathlon coaching training. In 2015, he reached milestones of 30 triathlons and 20 running races over 10 years - including Ironman Mont Tremblant 140.6 in 2012 and three times at Ironman Syracuse 70.3. Through this experience, Dan has learned a lot from his mistakes and gets a big kick from sharing the joy of this great sport! Chuck has been with TrYForce from the beginning and enjoys the opportunity to coaching cycling and Brick workouts. He has done a variety of Sprint and Olympic distance triathlons, XTerra off-road tri's and a couple Half-Iron distance tri's, as well a new interest in cyclo-cross and gravel bike races. But Chuck mostly enjoys the members and the training that make TrYForce what it is. Leslie has been involved in many different athletic endeavors her whole life. From pre-school trampoline adventures to any sport she thought would be fun! Through elementary, high school and college her energy level keeps her moving. Having a “that sounds like fun” attitude has led her on many adventures, to include surfing in Australia and the West Coast of North America, skiing the Sudan in Whistler, repelling the Blue Mountains, hiking in BC, and travelling through Ireland and the Galapagos Islands solo. She turned back to running after spending almost 3 years in physical rehabilitation following a car accident in the mid 1990’s. No one was going to tell her what she could not do!!! This led to being a Running Room instructor and a team coach for Team Diabetes Canada, and running marathons around the world! Her venture into triathlon was a dare the night before a sprint triathlon in 2009 and fell in love with the sport immediately!! Leslie came to TrYForce in 2013 after moving back to Niagara that summer. She saw the TrYForce tent when she did the Niagara Sprint in 2012. The best thing about the Club is that you never have to be at an event alone ever again!! As an "adult onset athlete", Kim came to triathlon from running a few years ago kicking and screaming, dragged along by her friend and training partner Roxanne. Initially a reluctant swimmer, she's since learned to almost enjoy the water (or at least not dread it quite so much...) and finds that multi-sport training is the ideal way to stay active and social while enjoying what our region has to offer throughout the entire year. With past experience as a YMCA fitness instructor and as a running coach at a local running store, Kim is hoping to share her knowledge and enthusiasm to support and encourage other newcomers to multi-sport. When she isn't running, cycling, or swimming around Niagara, Kim enjoys sampling craft beer, camping, and shopping online for silly swim caps.